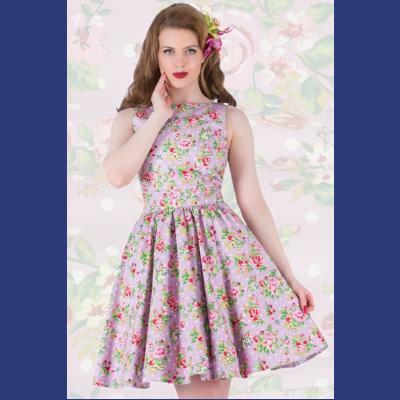 Lilac Delight Tea Dress by Lady Vintage is lilac cotton printed with pink roses, green foliage and white polkadots. 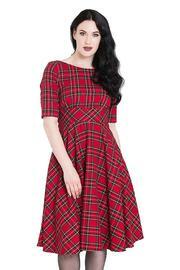 It features a 50's style flared knee length skirt which sits at theknee. 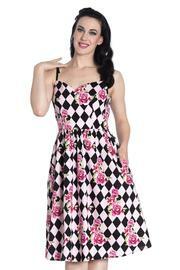 The lined fitted bodice has a high neckline at the front and a V neck at the back with a zip fastening. There's belts attached to the side seams at the waist which are tied into a bow at the back. 100% cotton. Machine washable at 30 degrees (delicate wash). Do not hand wash, do not soak, do not tumble dry. 8: Bust 33in, Waist 27in, Bodice 15in, Skirt Length 20.5in, Dress Length 37.5in. 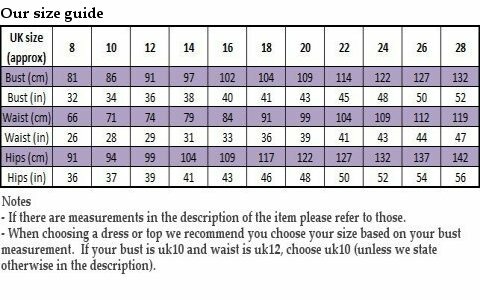 10: Bust 34in, Waist 28in, Bodice 15.25in, Skirt Length 20.5in, Dress Length 37.75. 12: Bust 36in, Waist 30in, Bodice 15.5in, Skirt Length 20.5in, Dress Length 38. 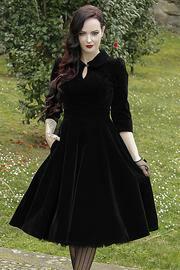 14: Bust 38in, Waist 32in, Bodice 15.75in, Skirt Length 20.5in, Dress Length 38.25. 16: Bust 40in, Waist 34in, Bodice 16in, Skirt Length 20.5in, Dress Length 38.5. 18: Bust 43in, Waist 37in, Bodice 16.5in, Skirt Length 20.5in, Dress Length 39. 20: Bust 46in, Waist 40in, Bodice 17in, Skirt Length 20.5in, Dress Length 39.5. 22: Bust 49in, Waist 43in, Bodice 17.5in, Skirt Length 20.5in, Dress Length 40.